The reading games below are ideal for supporting the development of reading skills. Use the games on your iPads and Android tablets as-well-as Mac and Window desktop computers and laptops. They’re also great for using with your interactive whiteboards. Have lots of fun using them at school or at home! Please register if you intend to use this site. If you like the reading games that you see here then you can find more of them on Club Roy. Follow the links in the main navigation. Little Mo has found a word plant. Help her put the words into alphabetical order. This reading game uses high frequency words. This game covers the letters 'a' to 'g'. There are four more versions of this game available that cover alphabetical order for letters 'h' to 'n', 'o' to 'z' and for more advanced players two versions that cover the complete alphabet. Checkout our subscription site to find them. Zara is dreaming of space again! Read the sentence then give the sentence its capital letter to make Zara's dream come true. Try not to wake Zara up! Want some more practice with your capital letters? We have another four versions of this game for subscribers. Zed our inventor tortoise features in this reading game. He loves to make things in his shed. Give the words their capital letters to help Zed collect his tools. What has Zed made this time? If you need some more versions of this game then head over to Club Roy, we have another four versions there for you to play. Old Uncle Tom likes his socks, blanket, hay and a nice glass of water before going to bed. Help him get his bedtime bits together by clicking and dragging the day of the week into the correct order. We have some more high frequency versions of this game on our subscription site including - numbers to twenty, colours (for the UK) and colors (for the US). Does it make sense game? Help Zara's dream come true by clicking on the sentences that make sense. Uses high frequency words. Need to have another go at getting your sentences to make sense? We have another four versions of this reading game available through our club website. Meet Wellington, he's our super recycling turtle - the hero of this reading game. Help Wellington clean up the sea by clicking and dragging the words to create sentences that make sense. Flash player is required for this game. Wellington continues his action in cleaning up the sea with another four versions of this reading game at our club. Wellington wants to recycle all the rubbish he is finding in the sea. In this game help Wellington make words using the double consonants ff and ss. Flash player is required for this game. We have more versions of this game that cover - bl and br, cl and cr, words that end in ck and ng. All at our subscription website, head over there to play them. The sentences have lost their full stop. Read the sentence then click and drag a snail to where the full stop should be. Uses high frequency words. Need to practice full stops a little more - four extra versions of this reading game are at our club. Lots of sentences have lost their full stops. Read the sentences then click and drag the three snails to where the full stop should be. Uses high frequency words. More reading games just like this are available for subscribers to our club. It's bedtime again and Uncle Tom is exploring words which have the long vowel phoneme 'oo' in them. Help him make some 'oo' words so he can have his bedtime bits. 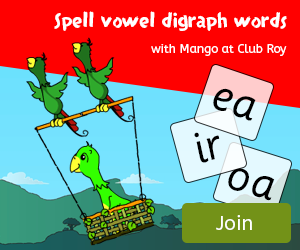 Many more long vowel phoneme reading games are available at our club - head over there to check them out. Help sort the months of the year into the right order to help Ol' Uncle Tom get ready for bed. Uncle Tom stars in more reading games at Club Roy. If you need more high frequency word games then head to our subscription website - more versions of this game cover numbers to twenty, plus color (US version) or colours (UK version). We also have a great collection of Tricky Word games there too. Zed is inventing things in his shed again. Give the sentences their question marks to help Zed collect his tools for his latest invention. What has Zed made this time? Four more versions of this game at our club. Play more versions of this singular plural game at our subscription website. Help the bees bring the words that rhyme with 'bug' back to their nest and watch the flower grow. Lots more words that rhyme games at our club, including four more versions of this reading game that cover words that rhyme with dash, dot, lip and top. Belinda, our chicken, loves eating apples. Find the words that rhyme with cat in the apples and bring them back to Belinda's house. You can pick more apples for Belinda at Club Roy with words that rhyme with Dad, gap, jam and man. Ryan the rhino is wide awake and it is a wonderful starry night. Can you help him find all the words that rhyme with hill? They're hiding behind the stars. Four more versions of this reading game at our club. The extra versions cover words that rhyme with - bell, pet, ten and tin. At the zoo, Lucy is thinking of words that have other words inside them. Find the words within the words and then give Lucy some presents to make her cell look nicer! Like this reading game? There are four extra versions of it at our subscription website. Many more reading games that follow the above themes are available at Club Roy, as-well-as other themes that support learning of long vowel phonemes, consonant blends and tricky words. Check out the links in the main navigation bar.